Believe it or not Birmingham is a bicycle-racing town. If you need proof consider this weekend’s Bump N’ Grind mountain bike race. 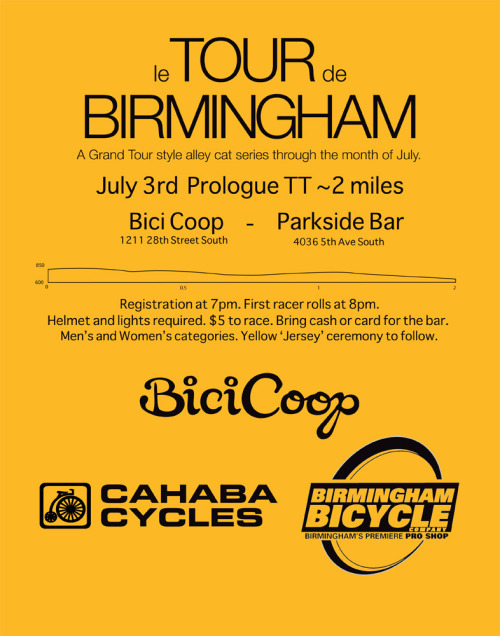 Presented by Birmingham Urban Mountain Pedalers (B.U.M.P. ), this year’s event marks the fifteenth year that the single track at Oak Mountain State Park has challenged pro and amateur racers from around the country. This race is arguably the best mountain bike race in the South (as well as the largest), so if you we’re planning a bike ride this weekend Oak Mountain is the place to be. Not only will you get to enjoy the park but you’ll have the treat of catching a glimpse of pro mountain bikers as they rail across the park and through the trails. Volunteers are needed, details here. The grassroots movement known as Critical Mass will attempt to make its presence known in Birmingham this evening at 6 p.m. Their inaugural ride will begin at Linn Park downtown. These rides, which take place monthly throughout the country (and the world) are geared to remind drivers that cyclists should be allowed to share the road and that they’re here. The cyclists follow all of the rules of the road, emphasizing bicycle safety and a sustainable method of transportation. There’s no real leader or plan to the route – it just seems to happen (and it’s been happening now for more than 15 years). As you can see, the longer it goes, the more people get involved – like the scene from NYC up above.